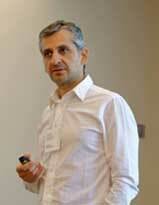 Kyprianos Papadimitriou took his PhD, MSc, and Diploma from the Department of Electronic and Computer Engineering, Technical University of Crete, Greece. He is teaching Computer Architecture, and for several years he has been involved in the laboratory assignments of Logic Design, Digital Computers, Computer Architecture, and Design of VLSI/ASIC Systems. In the earliest years of his career he worked in the industry on the hardware design and implementation of the first version of Bluetooth technology (1.0). After his MSc, he started a spin-off company for commercializing a motion detection device for people with disabilities. He has worked as teaching staff at the School of Electrical and Computer Engineering of the Technical University of Crete, and as research associate at the Foundation of Research and Technology Heraklion and at the Technological Educational Institute of Crete. He has several scientific publications and 1 US patent, and he is reviewing for top scientific journals and conferences (ACM Transactions on Embedded Computing Systems, IEEE Transactions on VLSI Systems, IEEE Embedded Systems Letters, ELSEVIER Microelectronics Journal, IET Signal Processing, IEEE FPL, IEEE ReConFig, ARC, ReCoSoC).